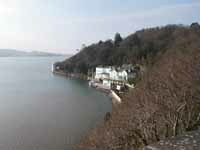 Portmeirion and The Prisoner got another airing on UK Television on Sunday 31st July 2005, when the BBC2 series "Coast" featured the location on its historical and anthropological look at Wales's Cardigan Bay coastline. Some beautiful aerial shots of the village were shown, complete with the obligatory Rover balloon and chant of "I Am Not A Number" from the slightly patronising presenter. Clips from the episode "Free For All" were also shown, before the journey took us accross the cob to Porthmadog, where comparisons were made between Sir Clough and William Madocks. The programme can be viewed online HERE. The entire series will be released on DVD in late October 2005. With thanks to Gareth Hughes and Postsoup for this news item.